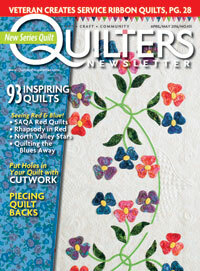 OF course that doesn't mean that the quilts are finished! But everyone got lots done and had a good time. 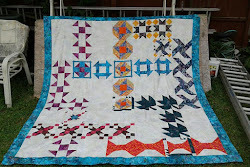 This quilt is pretty intense, but I was happy to see that they all had their blocks to the half hexagon stage by class. Some had laid them out at home...who could resist? so had an idea what they wanted to do. This one is Jane's...she had it the way she wanted it at home, but then couldn't recreate it here. Hopefully she got it back the way she had it once she got the blocks home. She wanted a scrappy look. So many pretty fabrics and great 3 color selections for light, medium and dark. Deb tried a little different arrangement...can you see her pattern? She is really concentrating on getting it the way she wants it! After class on Saturday, I went up to my hometown to see my mom, dad and sisters. I hadn't been there for awhile and had a great time catching up. I have spent the last few weekends (including Sunday) writing the patterns for the new Sampler. I still have one left. I start teaching the class tomorrow night. 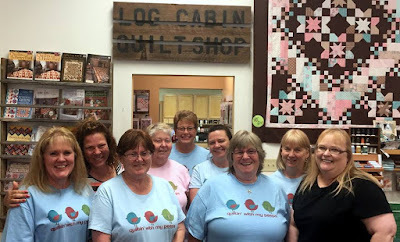 The Sampler classes meet once a month for 6 months. Those tumblers are just awesome!!! I can see how you couldn't just do one. WOW!! 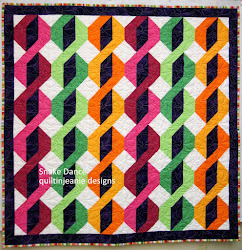 The Quilts you make in your classes are always awesome!